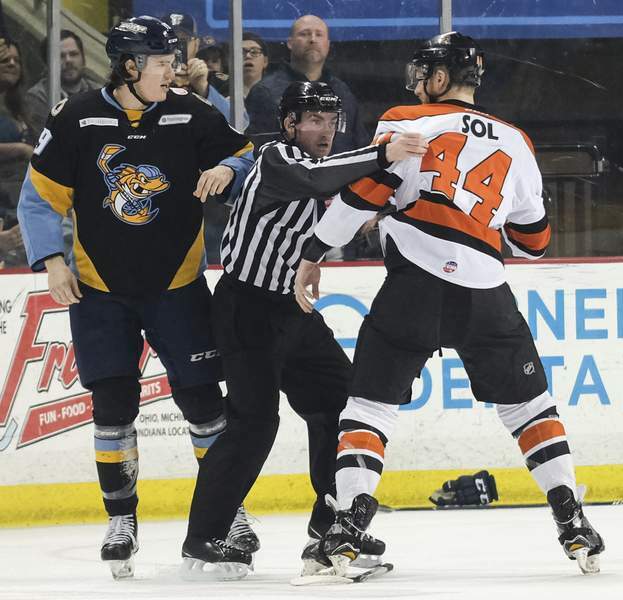 An official breaks up a skirmish between Toledo forward Ben Storm and Komets defenseman Cody Sol during Saturday’s playoff game. 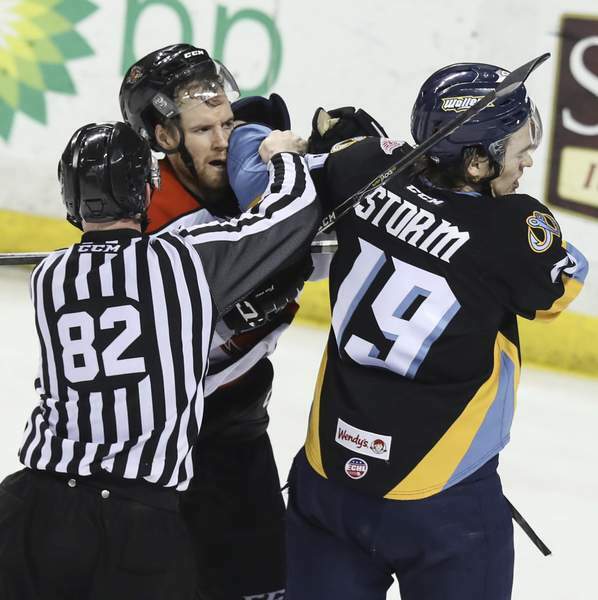 Jeremy Wadsworth | The Blade Komets defenseman Craig Cescon, left, fights with Toledo Walleye forward Ben Storm during the third period of Game 2 of the Central Division semifinals Saturday at the Huntington Center in Toledo, Ohio. 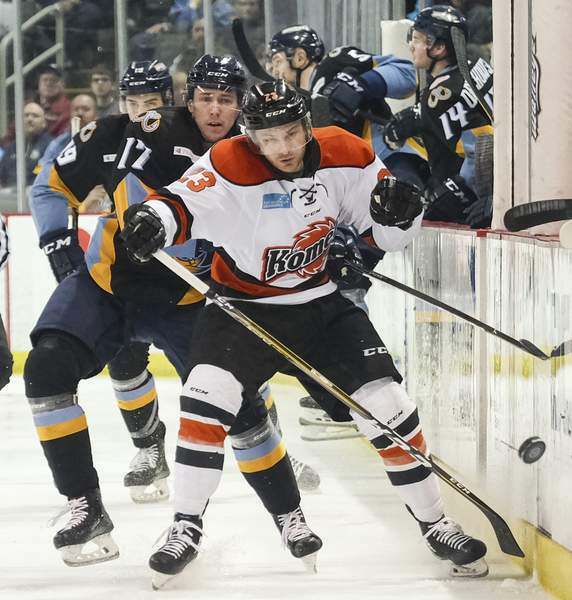 Photos by Jeremy Wadsworth | The Blade Toledo forward Chris Crane in front of the Komets while taking a shot on goal during Game 2 of the Central Division semifinals Saturday in Toledo. TOLEDO, Ohio – Coach Gary Graham had the best quote to sum up the Komets’ 6-0 loss today to the Toledo Walleye. 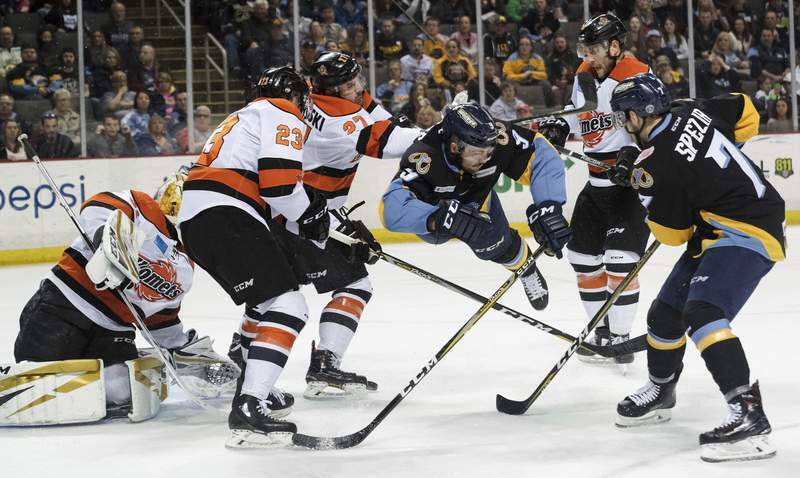 The Komets were outshot 43-23 by the Walleye, which has a 2-0 lead in the best-of-7 Central Division semifinals, but it really wasn’t even that close. 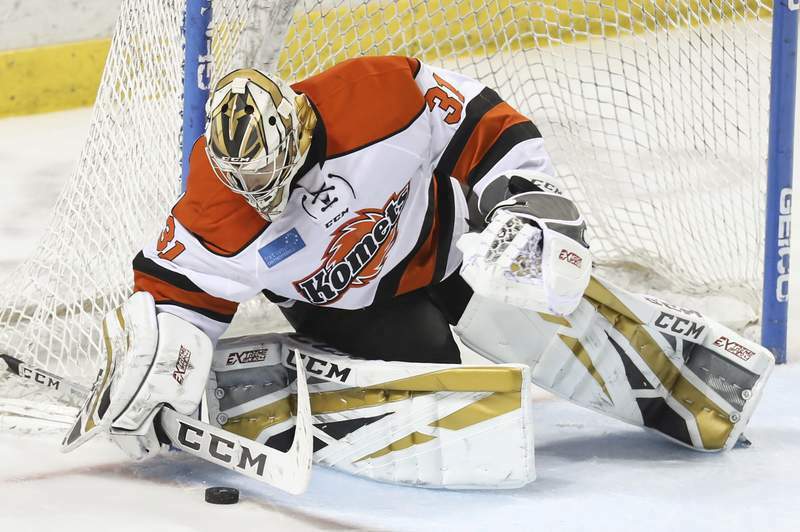 Zach Fucale made some great saves to keep the Komets in it. And while the officiating was bad – Toledo scored on 4 of 7 power plays; Fort Wayne was 0 for 3 – nothing can excuse such a one-sided game in the playoffs. Say what you will about Fort Wayne’s roster, it’s loaded with offensive talent. Brady Shaw and Jake Kamrass are the only ones with goals in the series, but even they were contained today along with Shawn Szydlowski, Justin Hodgman, Marco Roy and J.C. Campagna. 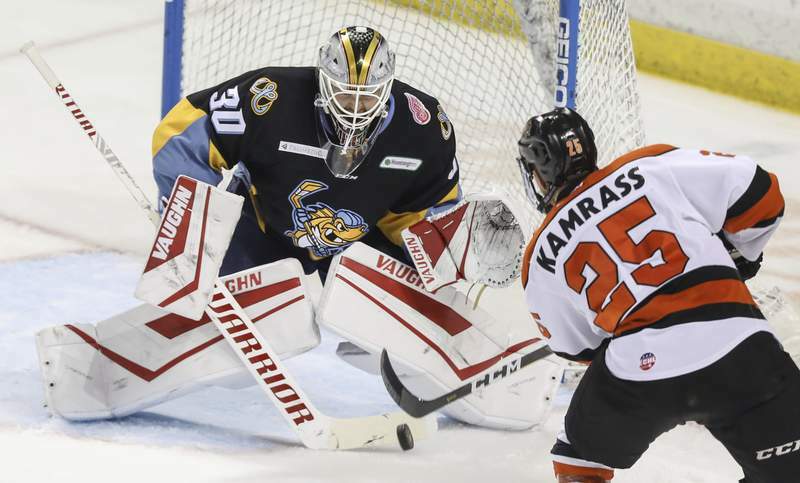 The Komets suffered their first shutout in the playoffs since the Jeff Lerg-led Walleye ousted them from the 2017 playoffs here. That was Pat Nagle’s final game in net for the Komets and he was on the other end of it today, stopping 23 shots for Toledo. These can be tough games on goalies, too, when they don’t face many shots. Nagle didn’t face many and was good when he needed to be.